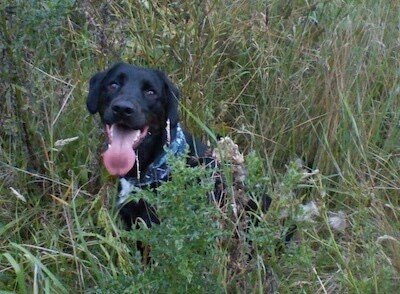 Wister the full-grown Labradinger—"Wister = 50% black lab (father) / 50% English springer spaniel (mother). The best dog I've ever owned; my all-time favorite pet! 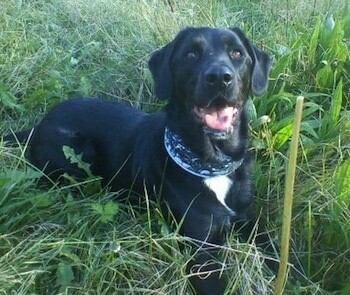 Wister is gentle, intelligent, loving and very outgoing. He's people-oriented, with lots of spirit (and a comedian)!" 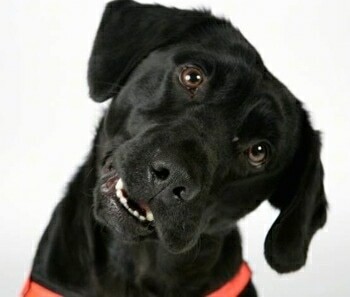 The Labradinger is not a purebred dog. 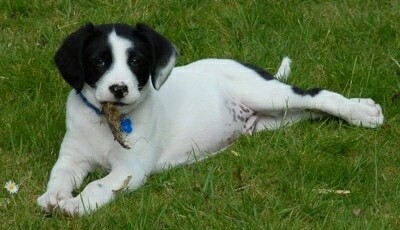 It is a cross between the English Springer Spaniel and the Labrador Retriever. The best way to determine the temperament of a mixed breed is to look up all breeds in the cross and know you can get any combination of any of the characteristics found in either breed. Not all of these designer hybrid dogs being bred are 50% purebred to 50% purebred. It is very common for breeders to breed multi-generation crosses. 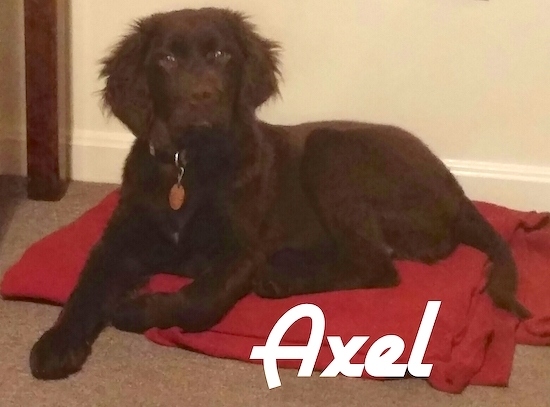 "Axel is my Labradinger shown here as a 4 month old puppy. He is extremely smart. He loves to retrieve and isvery loving." "Ellie, my six-year-old Springador (UK’s choice) or Labradinger (US choice) is in her ‘working’ gear in one picture as she works with me as a Fire Investigation Dog; we search fire scenes to ascertain the cause of the fire. If someone has used a flammable liquid (like petrol) to start the fire Ellie will show me exactly where it is." 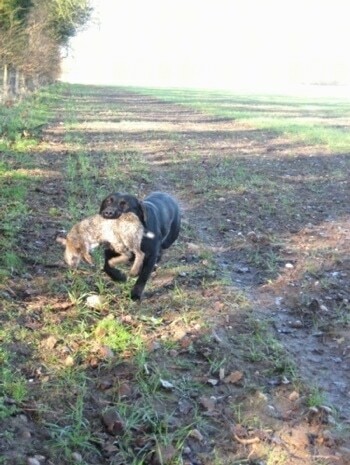 "She was originally bred and trained as a working gundog and nothing will stop her from retrieving something if I ask her to. She loves searching and after several hours of exercise will look disappointed when I put her back in her kennel. All her training is done using tennis balls as her reward; if my stock of tennis balls is running low I’ll take her to the local park and the bushes around the tennis courts, we are guaranteed to come home with a bag full of ‘lost’ balls." "She is an outgoing dog that will give anything a go, being eager to please and everyone’s best friend, she is a hit at the local park." 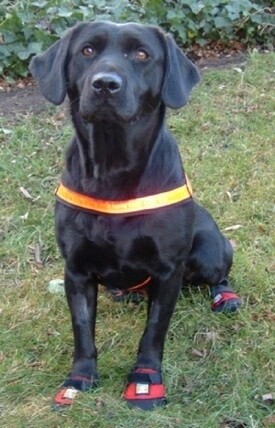 Fluke the Labradinger at 2 years old—"Fluke is full of energy and has a very gentle nature. 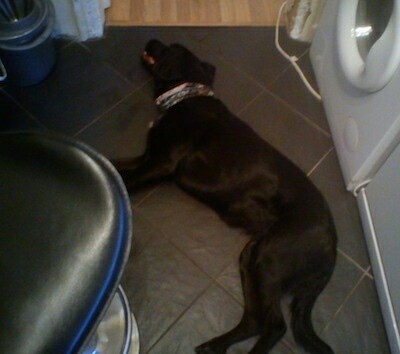 She loves chasing anything that moves, hiding in long grass and playing with her friends at doggy daycare." 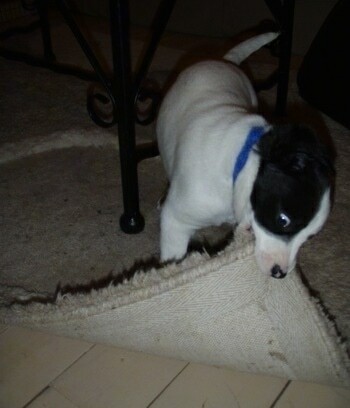 "I took this picture of our 9-week-old pup Jacca testing out his teeth on our rug! He's actually been a little angel. We expect the odd chomp and wee at this age, but his training is coming along nicely. We watch the Dog Whisperer and are training him already; he's responding well. Bless him." 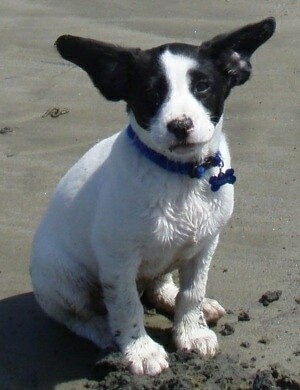 Jacca the Labradinger puppy at 12 weeks (English Springer Spaniel / Labrador Retriever mix)—"Jacca was on the beach where there was a really strong wind which blew his ears out sideways (note his resigned expression! He hates wind and rain!)" Princess the chocolate Labrador / Springer Spaniel mix (Labradinger) puppy at 3 months old—"Her siblings looked more like chocolate Labs. One had a white spot on his chest. Another was darker brown/black with brown markings on her face. Our “Princess” was the only spotted one. 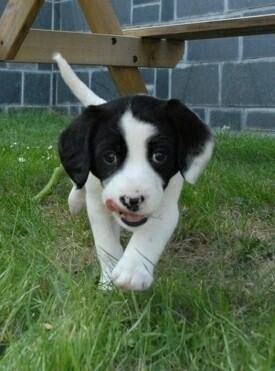 Her mother was the Springer Spaniel and she only had a small area of spots and was mostly black. So far, Princess has a great personality and is calm but playful especially in the morning. She taught herself to retrieve items at 2 ½ mos. She does love to chew on things. She also has one brown eye and one blue eye."